Whiting Bay Bowling Club held their prize-giving and dinner in Felicity’s at Eden Lodge on Saturday December 22. 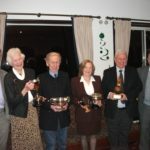 The 2018 trophy winners were: Federation Triples 2018 – Sid Allen, Neil Cook, Robert Frame. Co-op Salver – Keith Kelsall, Neil Cook. Angus Cook Memeorial Trophy 2018 – Neil Cook, Neil Pringle, Marette Pringle. Royal Bank Trophy 2018 – Robert Frame, Ann Frame. Anniversay Triples 2018 – Robert Frame, Ann Frame, Kenny Mabon. Fun Week Shield – Neil Cook, Marette Pringle. Shurig Shield 2018 – Robert Frame, Johnny McGovern, Ann Frame. Kiscadale Shield 2018 – Robert Crawford, Charlie Weir. Gordon MacDonald (nom pairs) 2018 – Keith Kelsall, Jenny Douglas. Jim’s Trophy (nom sets) 2018 – Ann Frame, Robert Frame. Tom and Jennie Robison (drawn pairs) 2108 – Marette Pringle, Ann Frame. Gents singles 2018 – Robert Frame. 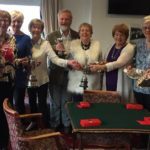 Ladies singles 2018 – Ann Frame.